B&W develops new Sound System for Primavera music festival | What Hi-Fi? Bowers & Wilkins combines top-end hi-fi quality with "raw power" in new PA system for Barcelona's annual Primavera festival. 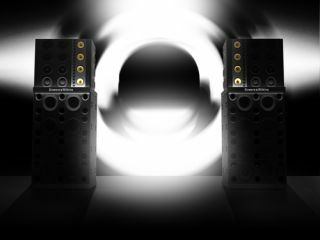 Music lovers travelling to Barcelona's Primavera festival are set to experience the "range and clarity of a top-end hi-fi speaker" with "raw power" thanks to English firm Bowers & Wilkins. B&W has announced its new Sound System – a PA system that will be responsible for delivering sound to thousands of revellers in a one-off commission especially for the festival. Sound System uses a number of "core B&W technologies" – including Decoupled Double Dome aluminium tweeters that you'll normally find in the company's CM10 floorstanders. Rohacell bass drivers based on those in the CT800 Custom Theatre Range and FST Kevlar mid-range drivers from the 800 Series Diamond also feature in the new Sound System. Flowport technology has been installed to aid the bass loading of the Sound System, which has a four-way loudspeaker design – and its debut appearance will comprise four stacks. Each of the stacks will stand more than 3.2m tall and houses 12 separate enclosures, which have been split into three frequency types and will incorporate eight 15in bass drivers. The roster also includes eight 10in mid-bass bass drivers; four 6in FST Kevlar mid-range drivers; and 16 1in tweeters. The system's crossover frequences are 80Hz, 350Hz and 3.5kHz. Active DSP filters will feed a number of Class D stereo power amplifiers to produce an output totalling 30kW. The stacks will be used in a 1,000-capacity 'geodesic dome' structure. If you're one of the many music lovers travelling to Primavera this summer, you can check out the B&W Sound System at the Bowers & Wilkins + Boiler Room Stage. The B&W Sound System follows in the footsteps of the McIntosh Despacio system, which brought nearly 50,000 watts of McIntosh power to a club soundsystem. Earlier this year, B&W took the wraps off its new 600 Series of hi-fi and home cinema speakers – with the latest 685 speakers already having wowed our testing team.